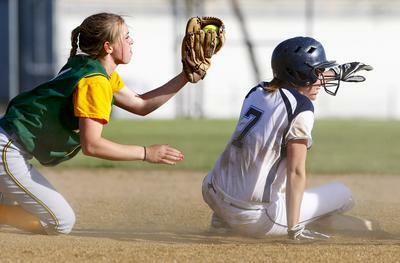 It’s safe to say that Thursday’s crosstown softball game between Great Falls High and C.M. Russell High is one of the most anticipated of the season thus far. You can read more in Thursday’s print edition or online. But the two teams are arguably the top two in the state if last year’s state tournament and this year’s play is any indication. The Rustlers topped the Bison twice on the state tournament’s final day for the Class AA title last May and GFH has been itching for another chance. The Bison have cruised to a 9-1 mark so far this season including a 4-1 mark in Eastern AA play. The one hiccup came against Butte and GFH rectified that in the nightcap of that doubleheader last week. Mercedes Bourgeau has been a force at the plate (.595, six home runs, 18 RBIs) and in the pitching circle (5-1, 4.42 ERA) for the Bison. She gets the nod Thursday. Meanwhile, the Rustlers dropped their first two games of the season sans returning Super-Stater Alissa Keeler, but have bounced back to win five straight. Hartman (2-2, 2.20 ERA) is scheduled to start today. The southpaw is averaging a strikeout an inning. Keeler (3-0, 2.93) is also a key hurler for the Rustlers. Try as the teams might, all the players know this isn’t just another game. The teams are well-acquainted with one another and not simply because they practice on adjacent diamonds at the Multi-Sports Complex. CMR and GFH split their regular-season meetings last year and the Bison took the first game at the state tournament before the Rustlers won two to win the title.